JobTestPrep is a leading psychometric test preparation site in the world. We have recommended their practice test packs in a number of our posts and have received fantastic positive feedback from readers who purchased and used the preparation tests to pass their real recruitment tests. As a result, we would want to dedicate a section of our blog to write about their great products and services so more job seekers and graduates can reap the benefits from their practice tests and get the job they desire. Below is a list of frequently asked questions about the company and their products. JobTestPrep is the UK and Europe’s biggest provider of online practice resources for psychometric and job selection tests. It is headquartered in the UK and have branches in several other countries like USA and Netherlands. They provide practice tests that are similar to real tests used by many companies around the world including Australia, USA and European countries.They have preparation tests for almost every single industry and profession and lots of free resources. 2. What products do they offer? They offer a wide range of practice test packs such as Psychometric Practice, Aptitude Tests, SHL-style Practice Tests, Logical Reasoning Tests, Assessment Centre Practice, Kenexa-style Practice Tests, Saville-style Practice Tests, Onetest-style Practice Test, GMAT Practice Tests, IE Admission Tests, Army Aptitude Tests and UKCAT Practice Tests. 3. What are the benefits of practising their psychometric test packs? A large number of tests which can be tailored to specific job applications. Ability to practise tests on mobile devices anywhere any time with over 90% tests available on mobile devices. Access to lots of free resources and video tutorials. Up to date practice resources to reflect the latest trends in the testing industry. 1. Do JobTestPrep offer any free tests or practice resources? 2. How do their products compare to the actual tests made by SHL, Revalian, Kenexa and other test providers? Their products aim to simulate the tests used in job applications as accurately as possible. They have a dedicated test development team that studies these tests and create practice packs that give users a practice experience that is as realistic as possible. The numbers or shapes, or words that you’ll work with to solve problems in practice packs are not going to be the same numbers that you’ll be faced with in the real thing. But the reasoning and strategies behind the test remain the same. 3. How do I know which pack is right for me? 1. Once I purchase a practice pack, how long will I be able to keep practicing? License options vary, from 1 week to a full year. Each product has a flexible license option, allowing you to choose how long you’ll need to practice for. 2. If I don’t like a product, will they refund me? Yes, you can see their refund policy here. 3. How will we get notified when a test pack is on sale? Like the JobTestPrep Facebook page [affiliate link] to stay up to date with the latest news about psychometric testing, employment and, of course, JobTestPrep products. 4. I’m not sure which test I need – who can I speak to? JobTestPrep have a dedicated support team ready to answer all your questions (before and after purchase) regarding which tests are right for you and how to prepare for particular assessments, as well as answering technical and support issues. All the relevant contact information is here. 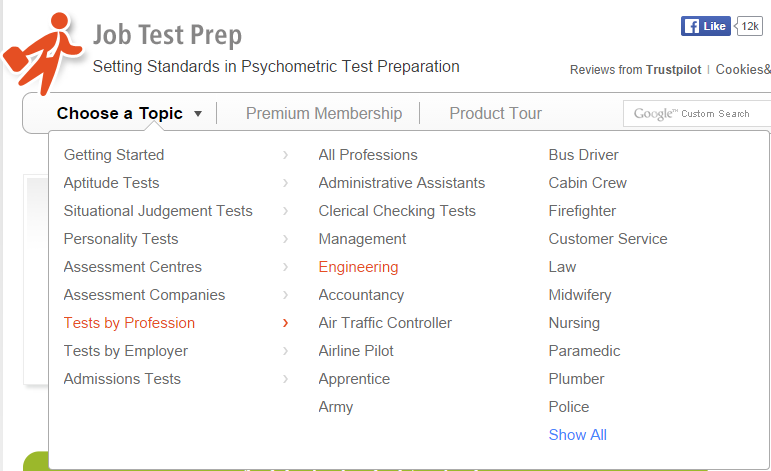 Visit this page to see how their practice psychometric test looks like.